I recently had my first newspaper article published in one of our local papers called The Green. It’s a lovely publication designed to promote local businesses in a rather stylish way I must say. It’s not packed with adverts or junk flyers which is refreshing. 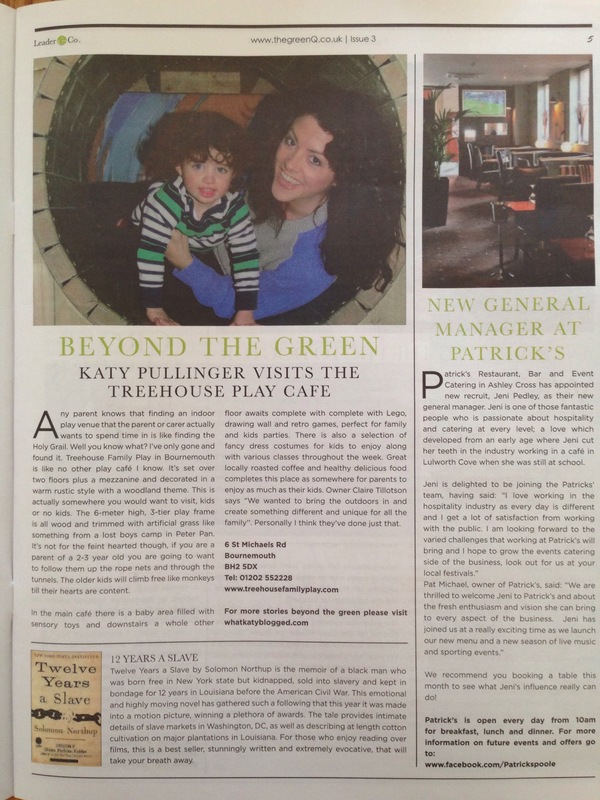 So when I was asked if I would like to write a piece for the ‘Beyond the Green’ section I of course said yes. I was free to write about anywhere I wanted and as I have spent the last 2 and half years bringing up my daughter I thought I would write about one of the places I like to take her too. Treehouse Family Play in Bournemouth, Dorset. Here is the finished article as seen in The Green and below is the transcript. Any parent knows that finding an indoor play venue that the parent or carer actually wants to spend time in is like finding the Holy Grail. Well you know what? I’ve only gone and found it. Treehouse Family Play in Bournemouth is like no other play café I know. It’s set over two floors plus a mezzanine and decorated in a warm rustic style with a woodland theme. This is actually somewhere you would want to visit, kids or no kids. The 6-meter high, 3-tier play frame is all wood and trimmed with artificial grass like something from a lost boys camp in Peter Pan. It’s not for the faint hearted though, if you are a parent of a 2-3 year old you are going to want to follow them up the rope nets and through the tunnels. The older kids will climb free like monkeys till their hearts are content. In the main café there is a baby area filled with sensory toys and downstairs a whole other floor awaits complete with Lego wall, drawing wall and retro games which is perfect for family and kids parties. There is also a selection of fancy dress costumes for kids to enjoy along with various classes throughout the week. Great locally roasted coffee and healthy delicious food completes this place as somewhere for parents to enjoy as much as their kids. Owner Claire Tillotson says “We wanted to bring the outdoors in and create something different and unique for all the family’’. Personally I think they’ve done just that. Here are some more pictures from the Treehouse that we didn’t have room for in the paper. A few other things worth noting if you want to visit the Treehouse are that there is a large pay and display car park to the rear of the building and you can find directions to it on the website here. www.treehousefamilyplay.com Also the building itself has steps at the main entrance so if you are arriving with a buggy you will want to come in round the back of the building. It’s clearly signed and you ring the doorbell and a member of staff will be happy to let you in. I would love to know about your thoughts on the Treehouse so please feel free to leave your comments below. I must admit I’ve not been to the TreeHouse yet as I tend to go to Lemur Landings but your pics look fabulous! Might add it to my rainy day list.